Many couples find themselves at a point where they need a romance boost. How can husbands and wives break through the many obstacles and issues that have derailed their desire and get back on track to being the crazy-in-love couple they once were? Even if you have a great marriage, wouldn’t a little more romance be nice? This year’s Marriage Conference will help you rekindle the romance in your marriage. Theme: Pastor Greg Burdine will share principles from Song of Solomon to help couples find True Romance. Reservations MUST be made with Faith Baptist Church. Seating is very limited. The Bible is well-known for its wisdom on spiritual concerns and righteous living. But did you know it can also guide you in matters of romance? Solomon had a few secrets up his ancient sleeves. 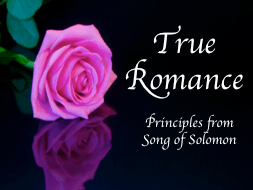 As you learn about the relationship of Solomon with his Shunamite bride, you’ll discover how you, too, can experience the deep emotional, romantic, and spiritual satisfaction that God created to be enjoyed in marriage. Every married couple can experience exhilarating romance.